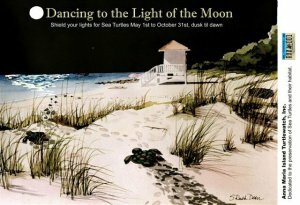 Summary: This project is designed to increase awareness of the importance of eliminating beachfront lighting that is harmful to nesting sea turtles through brochures, posters, stickers to attach to light switches in beachfront rental units and bumper stickers. The brochures will be placed in beachfront rental units. The light switch stickers will be put on light switches that control beachfront lighting so that anyone checking into a unit where beachfront lighting could be an issue is informed of the damage they could do to our nesting sea turtle population. The posters will be placed in restaurants, at the public beaches and in businesses around the Island so that residents, visitors and transients alike will be exposed to educational information relevant to sea turtle nesting beaches.